Perhaps more in-keeping with more traditional ovens, the HB55NB550B goes underneath your worktops rather than in a tall unit as is currently in vogue. 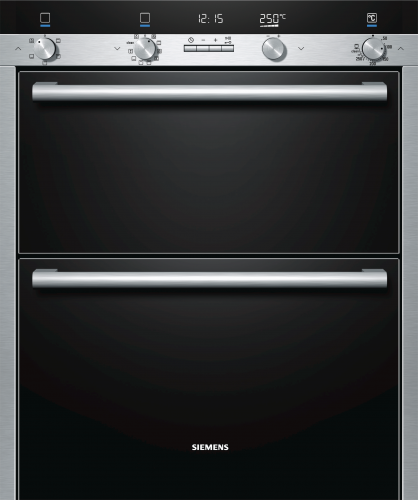 Absolutely loaded with features, you are sure to find this double oven a very suitable addition to any modern kitchen. For absolute ease of use, Siemens have been nice enough to include their lightControl control panel with digital display. This offers the ultimate in visual clarity and precision control of all functions of the appliance. Want to time your cooking? No problem! The HB55NB550B features a built-in timer with a state-of-the-art electronic clock too, ensuring you always know what time it is. Very useful. This can also be fully customised to match the style and colours of your kitchen. The highly coveted ecoClean coating within means scrubbing on your hands and knees is a thing of the past, leaving you free to enjoy your evenings once again. For the perfect results every time, Siemens’ 3D Hot Air technology allows you to direct two separate temperatures within the same oven. Absolutely insanely advanced stuff, right here! One really great thing about this is the ability to cook wildly different dishes without the flavours and smells intermingling in a detrimental manner.